Well done, Kirsty Gunn.This little book stirred up some big deep emotions. I cried at the end. I will keep it with me as I continue to live in far away places. 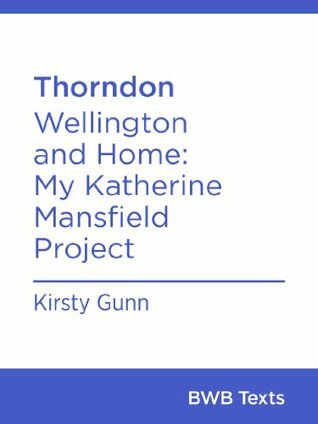 A delightful short book which has made me want to go back and read some more stories by Katherine Mansfield and also to find some of Kirsty Gunn's work.Coming back to Wellington, the place of her birth, Gunn spent a few months as a writer in residence at the Rendall Cottage in Thorndon. This allowed her to reconnect with places she knew as a girl as well as bring her own daughters to attend the same school that she did for a few months.There are lovely parallels between Gunn and Mansfield, about leaving New Zealand and thinking about coming back, as well as wonderful insights about seeing a once familiar city again. Interspersed between details of Gunn's Mansfield projet are short snatches of fiction that really catch to mood of a cold wet Wellington winter. Something that an outsider would notice more than a resident, little details about the need for flannelette sheets and the call of the 'dark-blue black bird" as she describes the Tui. A lovely book that will leave you with memories. Written in the form of a 'notebook' or almost 'scrapbook'--with bits of fiction and quotes from Mansfield mixed in with personal reflections, it is somehow both haunting and 'twee.' I read this while in Auckland and plan to revisit it this coming week while staying in Wellington. It may make even more sense to me once I am back in windy Wellie. I found this little book on the shelf in my school library and it is a real treasure. It showed me the links between Mansfield's writing and the place of Wellington and how Wellington is indeed a 'place'. This is a writer coming home and renewing a relationship with a unique world, which Gunn describes with great clarity and love. "Pearlit skies." Yes indeed. Hughly recommended for people who love accomplished wordsmiths. I'm now going to read Big Music. Kirsty Gunn returns to her native New Zealand as a Randell Fellow, and reflects on her own relationship to the country she left (she now teahes in Dundee) and to Katherine Mansfield, who also left NZ for Europe, never to return. There are reflections on the meaning of home, exile and memory which take in the author's personal experience, but refract it through Mansfield's own writing. KM couldn't wait to leave the old country, but in her restless life in Europe she recreated it down to the tiniest detail, at the same time layering NZ and Europe together to create a place that exists only in the stories. Gunn writes on Mansfield's deep concern with home, the family, the dramas of the domestic sphere; we learn of the unique qualities of NZ light, whch inform a reading of 'Sun and Moon', and a visit to the KM museum becomes a moving retrieval of personal memories. The 'Project' mixes journal, essay and fiction. Themes are brought out through some arresting short stories which explore ideas of travel, hauntings by the past and loneliness: KM presides over these, though they ahve their own strong personal voice. 'My Katherine Manfield Project' is a beguiling read, which sets up a refreshinglly new way of engaging with an author. I had some passing cavils. Though Gunn is the expert, I'm not sure it's true that the whole of 'Prelude' is seen through Kezia's eyes, as she seems to imply: part of its modernist feel comes from the multiple points of view. And a reader new to KM might not guess that she wrote many stories which are not set in New Zealand. The book is beautifully produced by Notting Hill editions, a publisher committed to the essay form and contributing to its resurgence in the english-speaking world. All about the interplay between what is home, and when you leave the place you grew up and live somewhere else, what does it mean when you return. It was interesting and some of Kirsty Gunn's short stories are arrestingly moving. I think I would have got more from it if I'd read anything by Katherine Mansfield and also the fact that it focuses on the fact both women have left Wellington for London, and having never been to new Zealand I almost felt a bit outside some points, like there was an expectation of familiarity. Kirsty Gunn - Kirsty Gunn was born in 1960 in New Zealand and educated at Queen Margaret College and Victoria University, Wellington, and at Oxford, where she completed an M.Phil. After moving to London she worked as a freelance journalist.Her fiction includes the acclaimed Rain (1994), the story of an adolescent girl and the break-up of her family, for which she won a London Arts Board Literature Award; The Keepsake (1997), the fragmented narrative of a young woman recalling painful memories; and Featherstone (2002), a story concerned with love in all its variety. Her short stories have been included in many anthologies including The Junky's Christmas and Other Yuletide Stories (1994) and The Faber Book of Contemporary Stories about Childhood (1997).She is also author of This Place You Return To Is Home (1999), a collection of short stories, and in 2001 she was awarded a Scottish Arts Council Writer's Bursary. Her latest books are The Boy and the Sea (2006), winner of the 2007 Sundial Scottish Arts Council Book of the Year Award; and 44 Things (2007), a book of personal reflections over the course of one year.Kirsty Gunn lives in Edinburgh, Scotland.